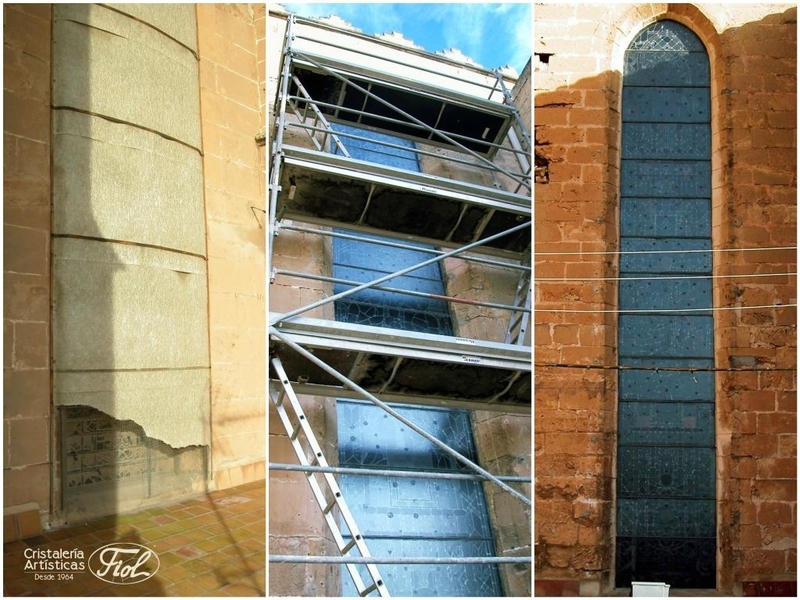 One of our important works has been the restoration of the rosette of the cathedral of Mallorca. From January to May 2009, all the windows of the rosette passed through our hands, 580 were saved, we changed 403 and 132 new glasses were added to covered holes. This has contributed to more light and has served to improve the famous show of the EIGHT, which occurs twice a year, on February 2 and November 11. All the glasses were cleaned, their edges cleaned and protected by a lead profile, to isolate them from contact with the sand. At the end, 1115 glasses were placed, distributed in 4 colors. 390 red, 311 green, 216 blue and 198 yellow, we use 850 meters of lead profile and 50 square meters of glass. 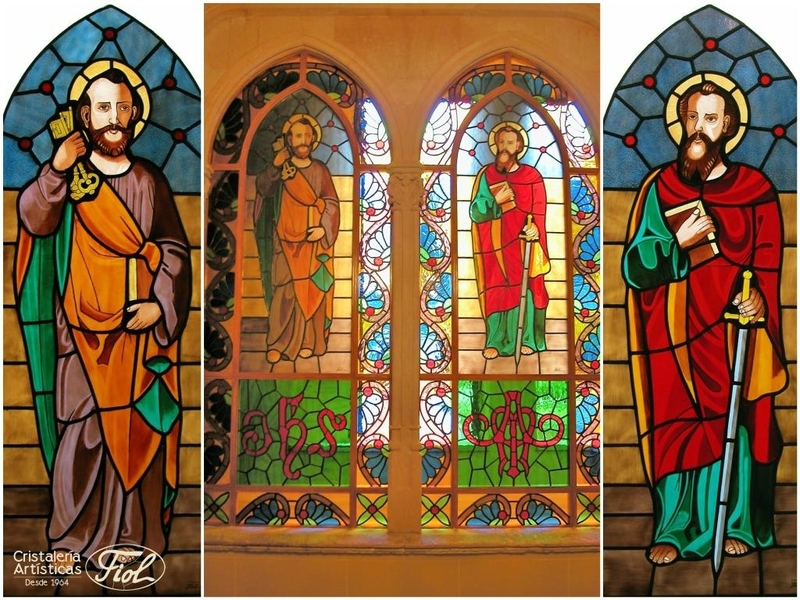 Realization of 4 stained glass windows for the Church of Cala Ratjada in 2016. 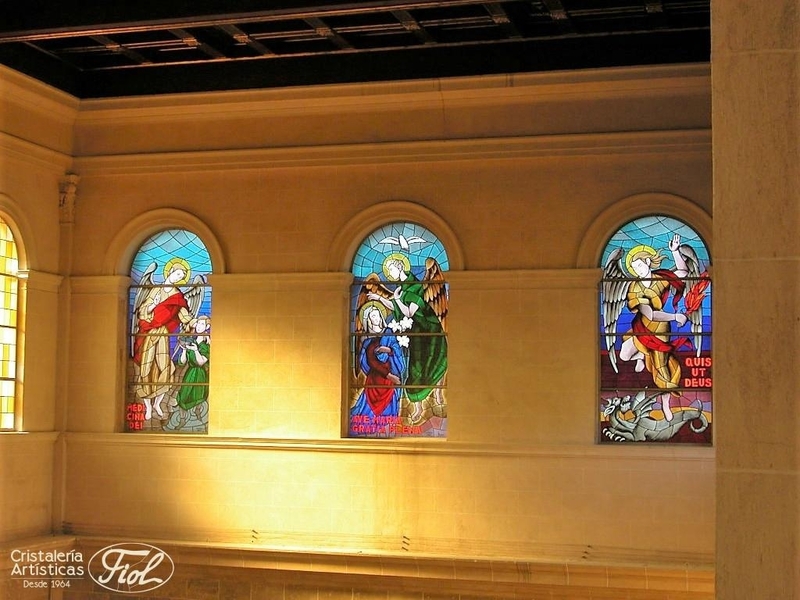 As you can see in the photograph, in the upper part we find the original drawings made by the artist Gustavo and in the lower part the leaded stained glass windows already finished. From the designs, we created the sketches made by Gustavo using different colors of glass and lead lines. For the creation of this work we had to use different techniques such as leaded, grisailles and fusing. To make these stained glass windows we invest approximately 3 months of work. 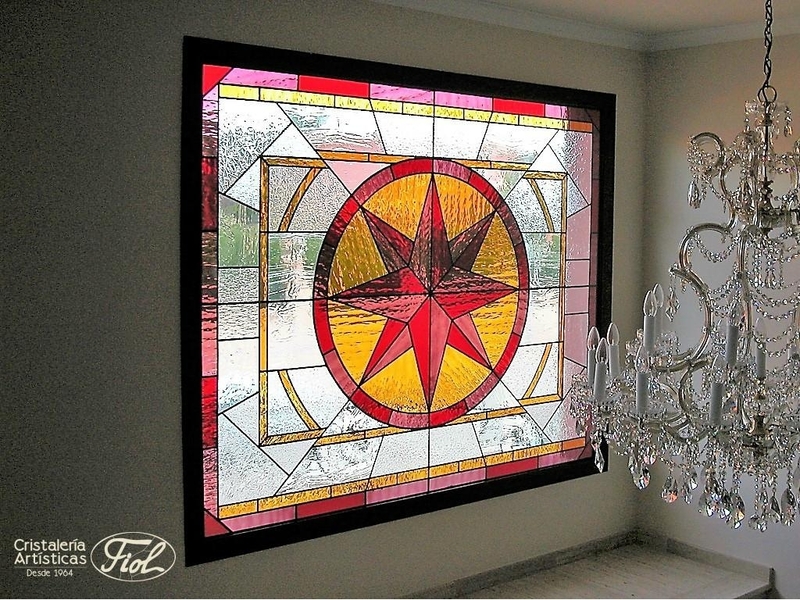 The largest stained glass window that we have made in one piece, measuring 170 x 200 cm. Made in spectrum glass with various colorless textures and various colors. The window was installed inside a climalit glazing composed of laminated safety glass. Its total weight exceeded 200 kilos. 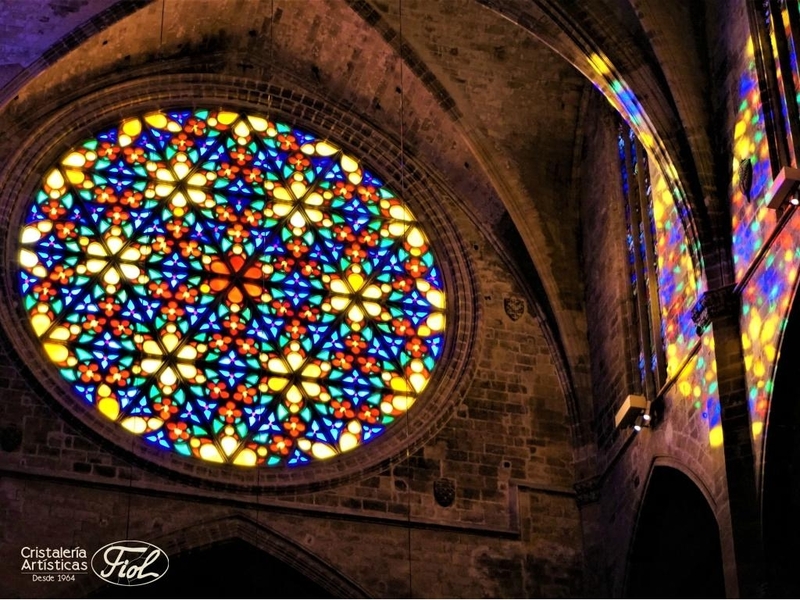 Between the years of 1991 to 1996, we restored and assembled security glasses to 32 stained glass windows in the Cathedral of Mallorca. Some of our works are made from photographs selected by the client. 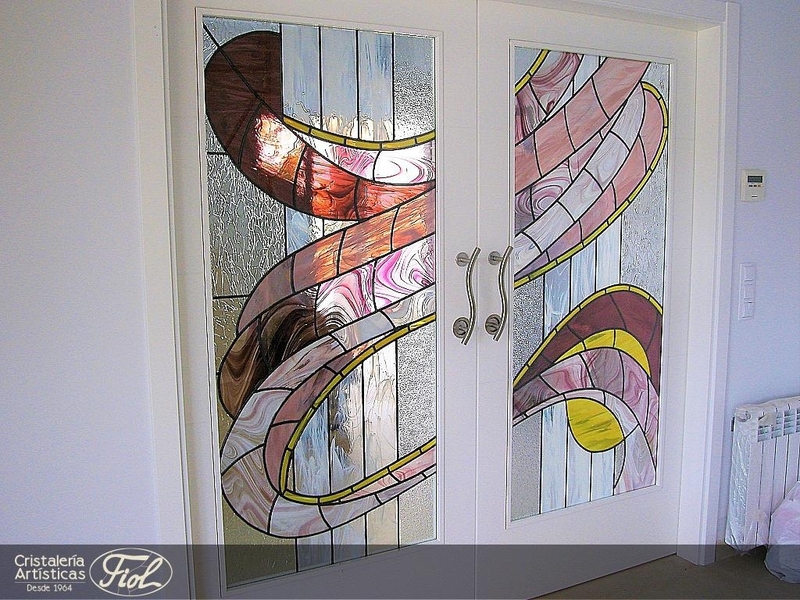 From the image we shaped in the best possible way the design in leaded stained glass. 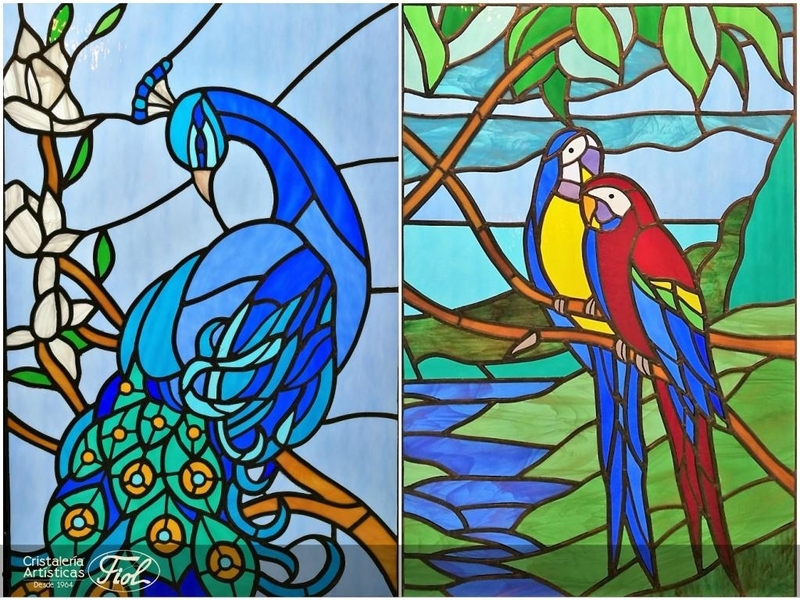 These two stained glass windows were made for a private individual in 2017. 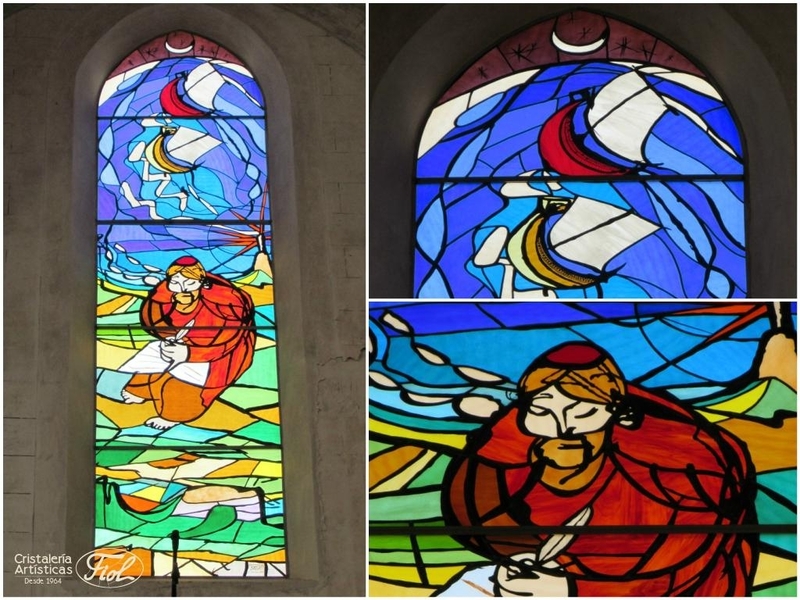 Stained glass window dedicated to Ramón Llull, installed in the Parish of Sant Miquel de Felanitx in April 2014. Designed by the artist Jaume Prohens. The stained glass measures 520 x 135 cm. and is divided into 5 pieces. Made all in glass spectrum and grisaille. 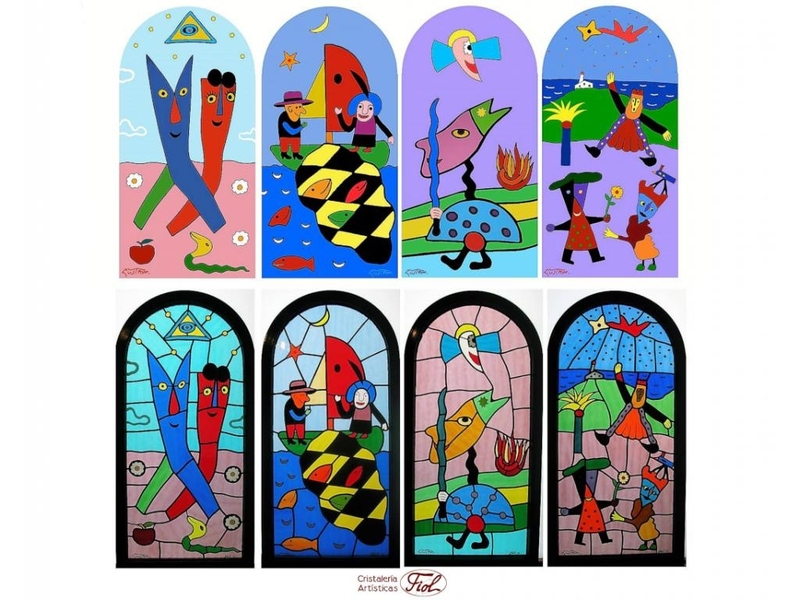 Realization of three stained glass windows for the Cas Concos Church in 1997. 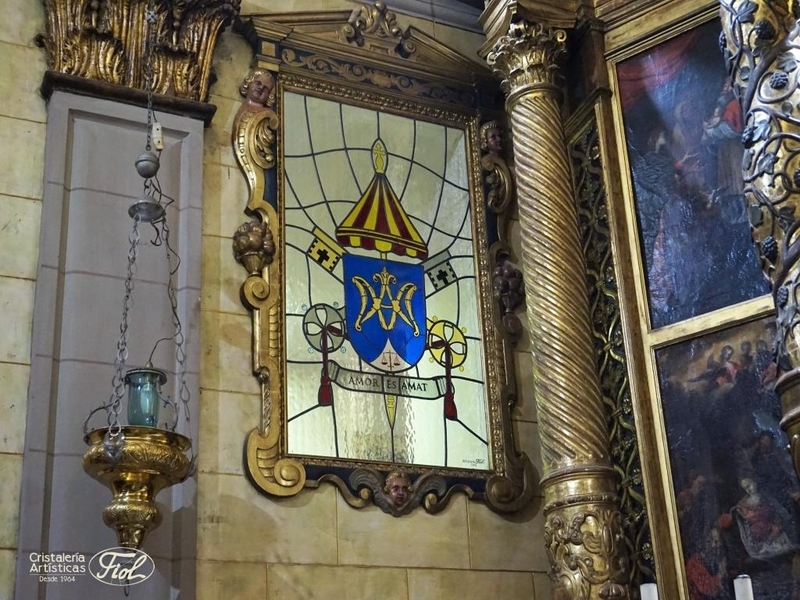 Dedicated to the Virgin Mary and the three archangels: San Miguel, San Gabriel and San Rafael. Elaborated according to original sketches of the artist Juan Maimó, who also participated in its manufacture. 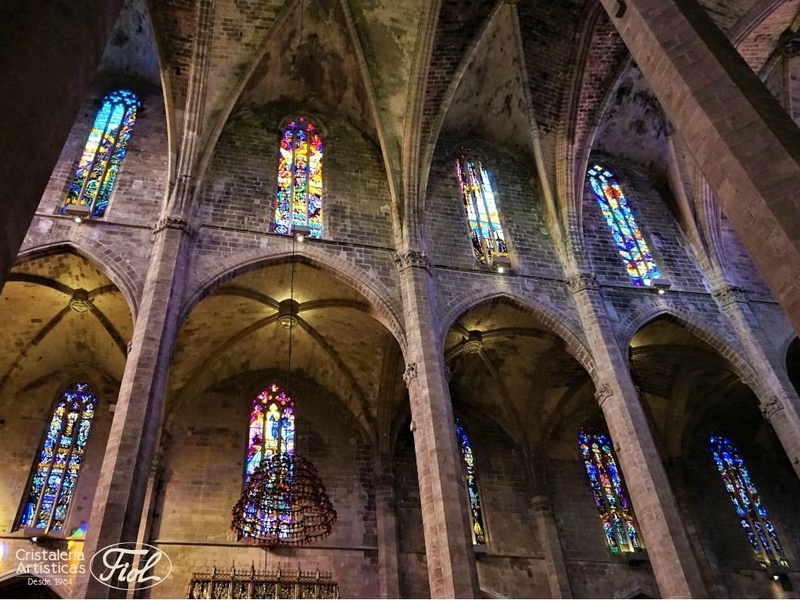 Restoration of 13 windows of the parish of Santa Creu de Palma. Each window is 8.5 meters high by 1.4 m wide and is divided into 14 pieces of approximately 60 x 140 cm. The restoration consisted of remaking 4 pieces again (very damaged by storms), replenishing glass, cleaning, soldering broken joints. Putty Knife and assemble safety glasses. 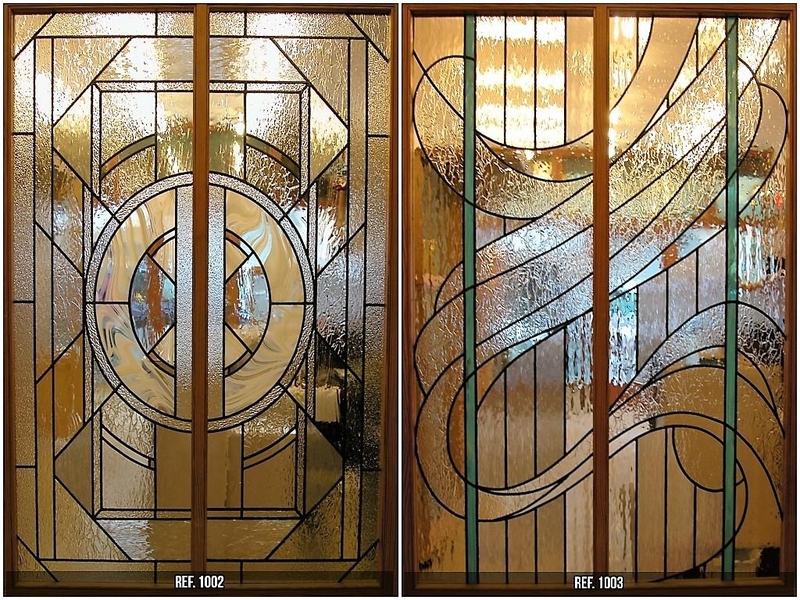 This stained glass, which we also have exposed in our store although with other colors (see the following image, Ref. 1003), was prepared in 2013 for a private individual. This new version was made based on the original design and the preferences of our client who, with our suggestions, chose the colors and glass samples. A perfect combination with the white of the door and the wall. Examples of work we have done for individuals. Ideal for double sliding doors. They can be modified with the different colors and models of glass that we have available (see an example in the previous image).